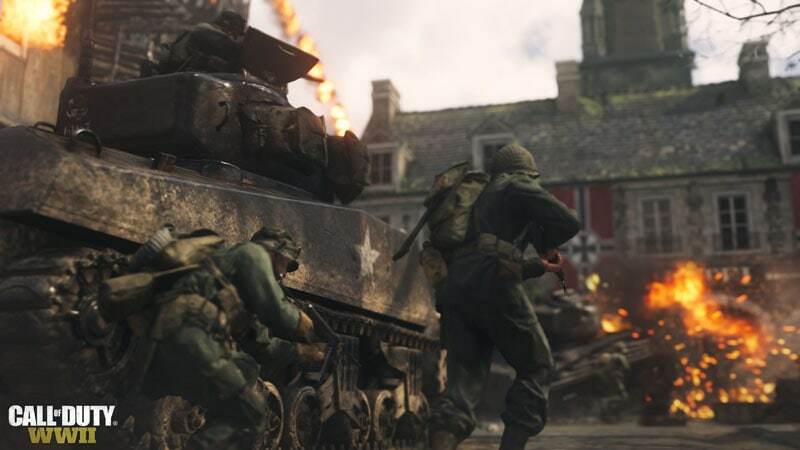 Like 2015’s Call of Duty: Black Ops 3 and Infinite Warfare, Call of Duty: World War 2 has three modes - a single-player campaign, Zombies, and multiplayer. Together, these ensure that there’s something for everyone. Pistols, rifles, and all sort of armaments have a weight, feel, and recoil as you’d expect from a Call of Duty game, though the flame thrower seems way too easy to pick up and use, and steadying the sniper rifle for more than a single shot is an exercise in patience. Traversal is speedy, so much so that you can zip by enemies in an area and onto the next objective, which comes in handy for some of the game’s stealth sections that nonetheless devolve into out and out firefights with barely any warning. While we appreciate the effort to add variety to the proceedings with stealth, it’s not really the game’s strong suit. It’s vintage Call of Duty, encapsulating a set of gameplay tropes we’ve become accustomed to over the years - with the introduction of minor, random slowdown at certain points. You could be driving a jeep through forests in France or slinking across an enemy base, but Call of Duty: World War 2 will drop in frame rate. It’s perceptible, annoying, and immersion breaking. This is present on the PS4 and PS4 Pro versions of the game. Thankfully it’s restricted to the campaign alone, and not other modes, but we hope this is something that can be addressed with a patch soon. Speaking of other modes, multiplayer is back and it’s as familiar as ever. While publisher Activision would like to call to our attention its shiny new additions like War - a narrative multiplayer mode akin to Battlefield 1’s Operations or Overwatch’s Payload, with play stretched across a map with a host of ever-changing objectives, such as escorting a tank or defending an outpost - the core gameplay remains the same as past multiplayer Call of Duty titles. Movement is pared down compared to single-player, regenerating health is present (unlike the campaign’s health bar that needs you to use health packs), and being on the receiving end of a well-placed bullet means death. The learning curve is steep and a slew of unlockables and a character customisation system exist to keep you coming back. It has the right intention, but in the current climate where loot boxes and micro-transactions are frowned upon despite being a staple for the franchise for a while now, it’s a little lazy that Call of Duty: World War 2’s supply drops - its version of loot crates - simply fall out of the sky and cards spit out of them to show you and everyone else what you got. 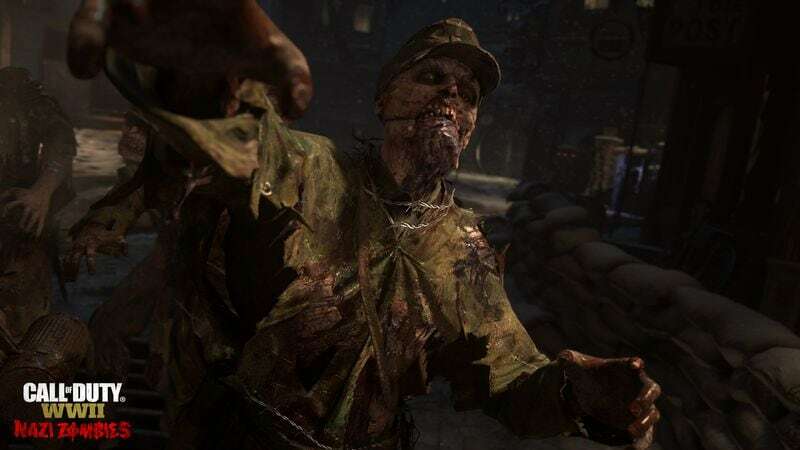 Finally, there’s Call of Duty: World War 2’s cooperative Zombies mode. Like past editions, you really need to play this with others. Taking on Nazi zombies is enjoyable thanks to great voice acting and elaborate presentation but there's only so much variety in fighting through zombie hordes. Playing it solo is dull and dreary. Throw in three friends though, and it's possibly the real reason to keep coming back when you’re done with Call of Duty: World War 2’s campaign, and bested by others in multiplayer. product Is COD WW2 worth checking out? We tell you in our Call of Duty: World War 2 review.